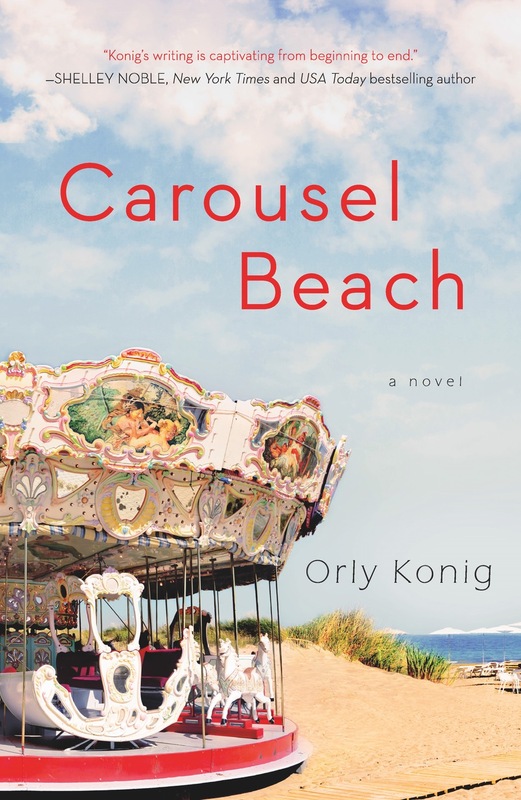 I’m going to be honest with you: Orly Konig is one of my favorite people in my writing world. I met her through our organization, the Women’s Fiction Writers Association, which she helped found as its first president, and I would’ve asked her to be here with Just Five Questions even if she didn’t have a new book coming out early next month I wanted her to talk with you about. Orly is a consistent cheerleader, my unofficial writing life coach (not even kidding), volunteer early reader, and a calm voice in the crazy tumult that sometimes comes with publishing. She’s also a fantastic mom, talented crocheter (is that a word, Orly? ), and well-versed in the languages of espresso and red wine (languages I will happily speak with her). After years of pushing the creativity boundary in corporate communications, Orly decided it was time for a new challenge and made the switch to fiction. Now she spends her days chatting up imaginary friends, drinking entirely too much coffee, and negotiating writing space around two over-fed cats. 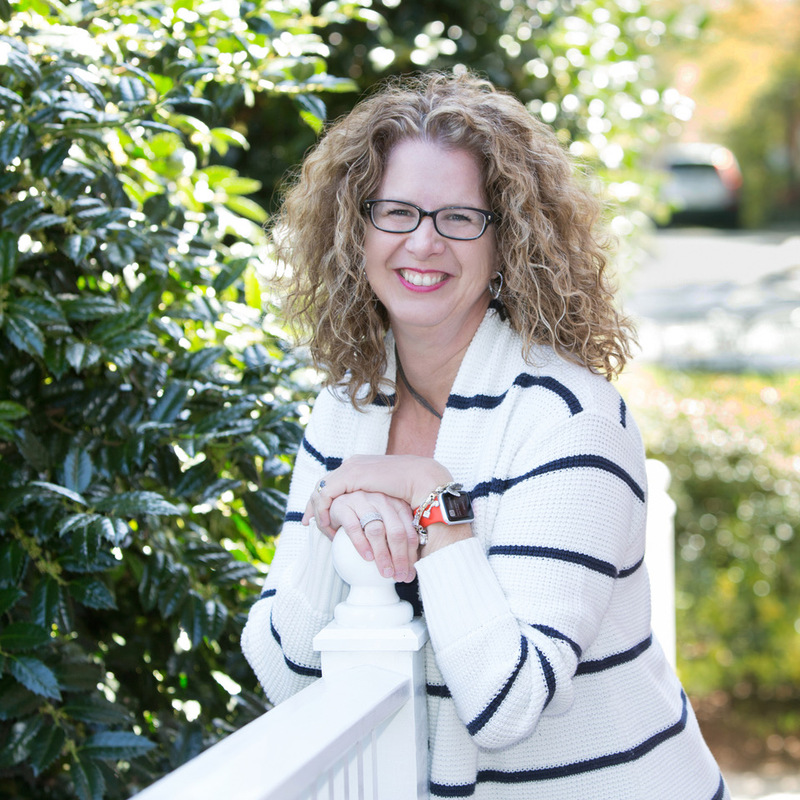 In addition to being the co-founder and past president of WFWA, she’s also a member of the Tall Poppy Writers and a quarterly contributor to the Writers in the Storm blog. Her first novel, The Distance Home, released May 2017 and Carousel Beach, releases May 8. So, Orly, you know I love the calm sweetness of your writing voice, and am excited for Carousel Beach‘s launch in just a week and a half. Tell us more about your new novel. 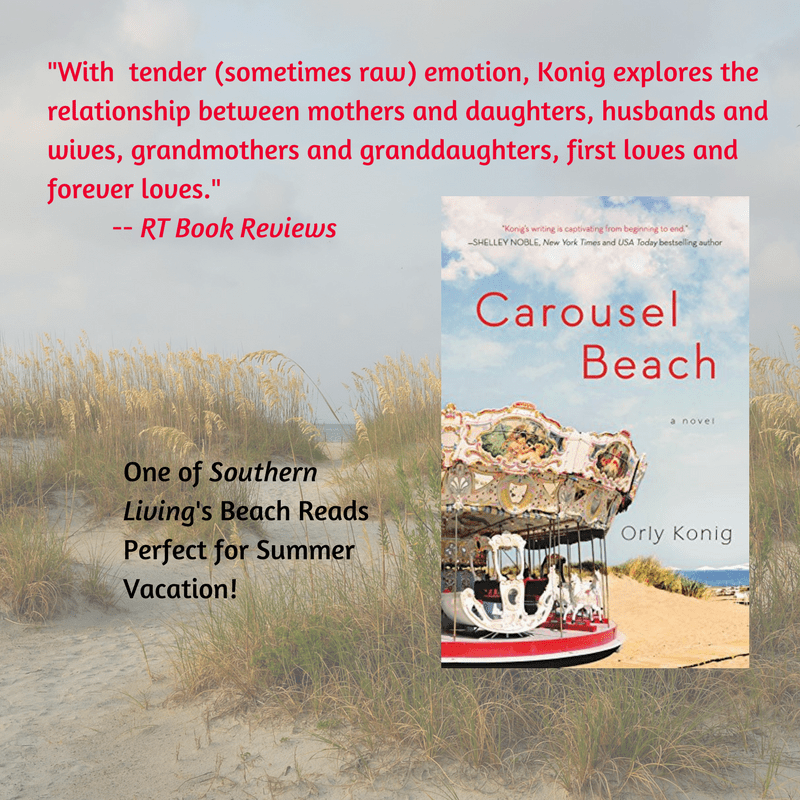 A cryptic letter on her grandmother’s grave and a mysterious inscription on a carousel horse leads artist Maya Brice to Hank Hauser, the ninety-year-old carver of the beloved carousel she has been hired to restore in time for its Fourth of July reopening in her Delaware beach town. Hank suffers from Alzheimer’s, but on his “better” days, Maya is enthralled by the stories of his career. On his “off” days, he mistakes her for her grandmother—his secret first love. While stripping chipped layers of paint from the old horse and peeling layers of fragmented memories from the old man, Maya untangles the intertwined secrets of love, heartbreak, and misunderstandings between three generations of strong willed women. When faced with setbacks or rejection with your writing, what was something that made you push through? That question should come with a stiff drink. Seriously?! Youza. Okay, okay. What made me push through the years and years of rejections? The rejections. Really. Getting rejections meant I was putting myself out there. That in itself was a huge milestone. It would have been so much easier to hide in the back of my safe cave and write and rewrite and dream about what could be. I was actually pretty tickled to get that first rejection because it meant I’d pushed myself out of my comfort zone. After that, I used them as markers for each manuscript. Personalized rejections were an opportunity to learn something: some agents provided helpful feedback and I’d compare what each agent said. If there was enough commonality, it was a nudge for a revision. When I reached the point that the feedback was more about personal taste, I knew I was close. I just had to find that one agent who clicked with the story and my voice. That’s such a pragmatic (not to mention reassuring and hope-giving) method for aspiring authors to use when it comes to putting their work out there or trying to find representation. Tell me: what methods do you use to balance the quiet life a writer needs to work with the necessary business of being a person with friends, family, and social responsibilities? Oh, that’s easy … I hide from social responsibilities. I’m only partially joking. I try to be as stingy with my daytime hours as possible. I work while my son is at school. The afternoons are non-stop with his activities and I try to avoid working in the evening s as much as possible. Obviously, it doesn’t always work. Those daytime hours are also when I have to get things done around the house or fit in appointments. And a writer’s days are split between the actual writing and the marketing/promotion of said writing. But even during busy times, I make sure to leave at least one or two days each week to hunker down in my cave and regroup. Ha! Hiding from social responsibilities tends to be the automatic side effect of writing, I’m afraid. What is your morning routine? My morning routine consists of dragging myself out of bed, fumbling with the coffee machine while feeding the cats and ensuring the right cat gets the correct medicine (both have gastro issues but opposite end of the spectrum; I do NOT want the cat with chronic diarrhea to inhale the food with the constipation medicine; that wouldn’t end well for any of us). I can usually get through one, maybe two cups of coffee before it’s time to get my child up and to school. Most mornings I use that time to plan out the day which means I’m usually feeling behind and frazzled before the day fully begins (note to self: stop planning out the days). Once I get him to school, my writer day begins. If I’m in the early drafting phases of a project, I usually get on the treadmill first thing. That’s where I plot out the scene I’ll be writing that day. At least that’s what I try to do. More often than I care to admit I end up sitting down “just to check one thing” the moment I walk back in the door and that’s pretty much the kiss of death for exercising. I had a couple of glorious weeks that I followed your advice, got up a bit earlier and spent 40 minutes just reading. I read more in those two weeks than I have the entire month of April. And because of the reading, I wasn’t fretting about the day to come (*highlighting that note to self from above*). But I go to bed too late and all it took was one morning of oversleeping to completely knock that awesome routine to hell. Ouuuuu, exercise. Past-life me loved spin classes and kickboxing. Present-day me counts bending to pick up the cat food bowls is exercise. Okay, I’m not quite that bad. I can’t say the exercise machines (treadmill, elliptical, rower) are favorites, but I do them on a regular basis. I use an app called Aaptiv that’s a lot of fun to motivate me through “classes.” Last year I started climbing a bit, and really enjoy it when I do it. The problem is getting over myself to actually do it. I tend to psych myself out about climbing if I haven’t done it in a while. It’s stupid because the moment I get on the wall, I’m proud of myself for having done it, but that pesky old self-doubt is always poking about one thing or another. Favorite way to be lazy? Watch a fun movie and crochet. Lately I’ve been crocheting little creatures to use as giveaways with my books. And I just started a sweater/wrap. When the weather is nice though, there’s nothing better than sitting under the weeping cheery tree in my backyard with a glass of wine, and daydream or talk to friends. Life is so busy that I don’t feel guilty about those rare moments of peace. I’m one of those weird people who actually prefer salads and healthy foods. Okay, wait … I love pasta and potatoes so hello vices, but I don’t have much of a sweet tooth. Between a cake or fruit, I’ll always go for the fruit. My attempt at eating well – and feeding my family well-rounded meals – is to plan out the week ahead. During the weekends we make a menu for the week and I work out what I need to buy when. It works in theory. I usually fall short in execution though. Luckily my son is very focused on healthy eating as well so between us, we tend to come up with not-the-worst solutions on the days we’re rushed. Food vices? Pasta and potatoes. Cheese. Soft serve ice cream. Gummy bears. Bread. What was I saying about eating healthy? Ignore that section of my answer. What’s one thing you’d like to tell another person trying to chase her dream? Decide what you want for your writing career and stick with it. I started working on what is now Carousel Beach in 2012. It was the third manuscript I wrote, and I think it was about a year from starting to write until I began querying. It won contests, received a ton of requests for fulls and partials, even had 3 R&Rs (revise and resubmits). And more rejections than I want to count. It would have been easy to give up. Friends and family kept asking why I didn’t just self-publish. But my dream was to have a book published with a New York publisher. The insane number of requests that book received told me I was on the right path even with the equally insane number of rejections. So I put that manuscript aside and wrote another book. That one got me an agent and a contract. Once I decided I wanted to be a published author, there was only one path. Decide what you want and believe that you can do it. What a wonderful note on which to end. Thank you so much for stopping by leahferguson.net, my friend, and I wish you the very best of luck as you send Carousel Beach out into the world. Carousel Beach can be preordered now through Amazon for $17.99–you’ll have it on launch day. If you want to follow Orly on Facebook, Instagram, Pinterest, Goodreads or Twitter, she’s been doing lots of fun giveaways (including a chance to grab one of the adorable little animals she crochets). As always, if you can take a moment to leave a review on a book you’ve read and enjoyed, it is very much appreciated.